003, originally uploaded by marsjoh. 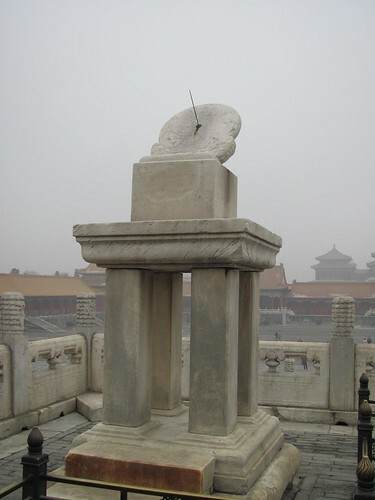 Who’d-a-thunk that Bell Express Vue was around in ancient China? I wonder what the Emperor did when the signal cut out or when his screen pixelized? Not so very long ago, the sight of my colleagues and I would have brought about looks of curiosity in Beijing. White faces were not all that commonly seen among the average populace. Visitors stood out and were usually visiting government officials of western businessmen. They were most certainly not seen in the alley markets and shops where the common folk shopped. Today, after the opening of Chinese society to the West, the integration of the Chinese economy with the rest of the world and increased tourism, Western faces are now commonplace. True, my colleagues and I did stand out from the crowd in some places more than others. And true, I would imagine that there are many places outside the urban centres where a white, bearded bald guy would still be a curiosity, but overall, we aren’t that big a deal anymore. And it is not only the social, economic and cultural changes that have contributed to this demystification of white folks. Think about the time that it takes to travel here. At one time it would take a year or more by ship. Then it was months by train using such magical routes like the Orient Express. The advent of air travel made the journey even less. And today? Well, with some favourable winds over the North Pole, we arrived on Tuesday afternoon after only 13ish hours in the air. In my lifetime the journey has gone from one of days to mere hours. The shrinking of the distance between our two societies is not confined to the spatial/ physical. Through the wonder of the Net and Skype, I spoke with my family this morning. And using a webcam, could see them as I spoke – in real time. For free. Culturally, I imagine that the lay of the land is much different now in the early 21st century than it was before the opening of Chinese society and the shrinking of the distance between our worlds. Much of the original culture is preserved – and rather ferociously, I imagine. A theatre listed only 2 of 9 features that were from Hollywood. In spite of a schooling system that insists on 5 years minimum of English language training, English is seldom heard and rarely understood. Rickshaws and bikes are still a prominent way to get around. 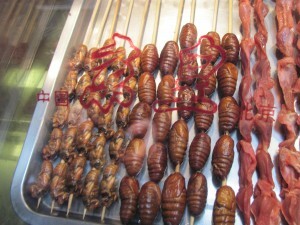 In side street markets there are scorpions and beetles on sticks – to eat shish kabob style! Even in the very modern buffet restaurant where we have lunch each day there are foods that I don’t recognise. But there is a KFC down the street from my hotel. And apparently a Wal-Mart at a mall down the street. And a Scrawny Ronnie’s too. My colleagues in the Chinese government tell me that they sort their household wastes into different boxes before pick-up. They compost organics. They worry about landfill space. We cut through a high-end mall that could have been in Ottawa, Toronto or Montreal… complete with eyeball-searing lighting, model quality floor staff and fashions that wouldn’t look out of place in the Resident Love Goddess’s closet. And Audis and Hyundai’s are replacing the bikes and rickshaws. It might be happening slowly, but ever so surely, western norms are an invasive species.